Web conferencing may be seen as just for distance learning or business, but there are many opportunities to exploit synchronous online communication for campus-based courses. With the overhead, and often cost, attached to enterprise-level systems, surely we should be exploring ways technologies such as Adobe Connect, Blackboard Collaborate and others can be used, where appropriate, across the broad range of contexts in an educational institution. The collective effort of a workshop at the Durham Blackboard Conference 2016, which aimed to address whether synchronous online collaboration tools could contribute to blended learning design, is captured below. In this post I go through nine learning activities using web conferencing are illustrative of the innovated learning experiences supporting campus-based students. The software forming discussions was Blackboard Collaborate, but the principles equally apply to other enterprise services and in some cases free-to-use personal services such as Skype or Google Hangouts. The following ideas and examples come from participants at the workshop, providing case examples of the three higher-level designs. Additional case studies from other institutions have been referenced. If you have external contacts who can share their professional or academic expertise, then using web conferencing software is a great way to give your students access to their experiences. Remote delivery of lecture is quick to set up, however to enable interaction with students will depend on the software you use. Skype is simplest for a one-to-many presentation in a face-to-face class, with communication via a chair. Mobile app-based multi-user conferencing for example via Blackboard Collaborate or Adobe Connect offers students direct interaction with the speaker. Within remote or face-to-face environments the mobile app could be used for students to send questions directly to the presenter and provide non-verbal feedback such as poll responses or approval/disagree/emotes. Text-based communication is preferred as managing verbal dialogue in class situations requires a good microphone set up to enable the remote participant to hear. Always test out with your guest speaker in advance, ensuring they are happy with the application, internet connection and the sound quality is good. In the session, the lecturer facilitates discussion as chair by repeating questions from room, or if in the multi-user situation students can use the mobile app to post questions directly. If students are distributed across many small group work spaces, such as labs, study rooms or studios, they can be connected together using web conferencing softwarea so that groups can share results and ideas with each other during the group activity. Within the group work session, the lecturer can deliver introductions, mini-lectures or address issues being raised that are useful for all groups remotely to all spaces. Taking this concept further, web conferencing obviously can support distance learning models where learners are at a much greater distance. The case study from Burke (2014) relates to a professional context where lectures that would suit remote transmission were done so via web conferencing rather than requiring attendance. Web conferencing still allowed interaction, incorporating a tutorial drop-in and a sense of timeliness and occasion, which video recording alone would not. Whether there is limited time in class to delve deeper into readings, or students have created their own special interest group, the toolset available in educationally-focused web conferencing software like Blackboard Collaborate or Adobe Connect can be used to facilitate reading groups outside of working hours or to encourage remote participation. These conference spaces can be set up for access at any time, or with a specific timed session led by a lecturer. 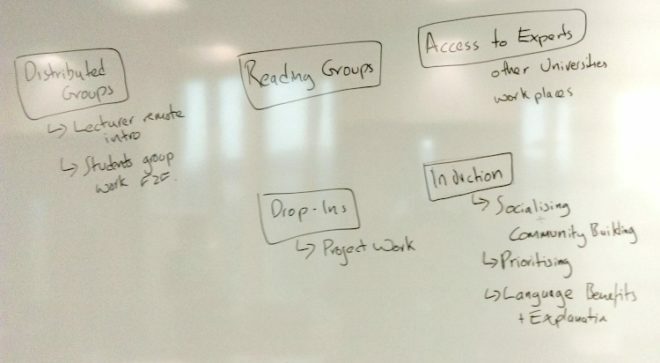 A structured session, whether lecturer or student-led, might look like this: introduce reading, key questions, break-out room discussion, whiteboard for idea dump, summary plenary. The whiteboard can be exported as a PDF for future reference. Breakout rooms allow smaller group discussions and separate idea spaces before bringing students together at the end. Despic (2011) outlines a similar approach for students using web conferencing software in a large cohort, where individual support is not practical or scalable. A peer learning model is delivered through web conferencing allowing students to support and learn from each other. Enterprise level web conference systems can often be linked from within VLE sites, scaffolded by instructions and resources that guide students through an extended task or longer group project work. Indeed, the integration within the VLE creates a closed space where users are authenticated, which Spiller (2014) noted helped manage and reduce off-topic discussions in text chat during web conferencing. Sessions can be linked to specific project milestones, with a lecturer reviewing project objectives. Open spaces can be created for groups to use ad hoc, for project meetings, enabling remote participation. Running these sessions online rather than face-to-face can enable project groups with students having competing priorities to still keep in touch and everyone encouraged to participate without geographical constraint. Web conference spaces can sometimes be configured to be ‘always on’ for participants to use, or a Skype or Google Hangout handle shared. This means that there is only one web link that can be shared for all supervisees. A specific time would still need to be arranged, or having a dedicated office hour where the web conference runs in the background. In this case, a slide that indicates students should run audio checks and then raise their hand when ready will notify you of their presence. Web conference software usually has screen-sharing features, useful for talking through an essay or programming code. Whilst these features are also available on Skype and Google Hangouts, it’s the single link access and ‘always on’ approach that means drop-in open office hours are possible through Blackboard Collaborate and Adobe Connect. For programmes with a year in industry or shorter-term work placement, web conferencing provides students the opportunity to reflect on their learning and share their experience with their supervisor or fellow students during the placement. One-to-one supervisions can be facilitated using Skype, but group sessions (scheduled or open access) may be better using multi-user platforms. Web conferencing enables remote and mobile participation, useful for certain forms of placement learning that emphasise reflective practice. Online sessions for skills development and workshops, perhaps even outside of working hours, or shorter sessions during lunch breaks may appeal to participants trying to balance commitments and avoid clashes with their degree course timetable. Some forms of web conference sessions can be set up with guest access, so all that is needed for participation is the link and no need to log into the VLE. The link can be shared publicly, or emailed to participants who register in advance. Sessions can also be recorded for distribution afterwards. The speaker presents remotely to students with a slide at the start to prompt use of audio set up wizard, beginning with sound check, welcome and session outline. Use simple interactions (yes/no, poll tool) to keep engagement throughout, helping participants check their understanding. Netskills (2014) brief evaluation summary shows how the use of web conferencing had a big reach, appealed to some types of learners, and regardless of the specific training topic would have the side-effect of familiarising users with the idea of web conferencing. A note of caution though that too technical a topic can create problems where learners are then expected to learn the mechanics of the webinar software as well as any other software being taught through the medium of the webinar (Wang and Hsu, 2008). Where web conference software can be used without log in details, this enables participants from outside the institution to take part in research seminars or to collaborate on projects. One example is YouTube Live. For seminars and presentations, the recording function is useful for dissemination, evidencing impact of research and logging research progress. It also provides a way-in for students to participate informally in research communities, for example giving doctoral students access to larger research projects. Spaces could be set up for ad-hoc use, or with time-specific sessions, e.g for public engagement. See also the case studies from the references which explore meaningful use of synchronous online collaboration in a range of learning contexts. Burke, Z. (2014). Building interaction into lectures using webinar, Sheffield Hallam University. Despic, O. (2011). The use of Virtual Classrooms to Support Peer Learning, Aston University. 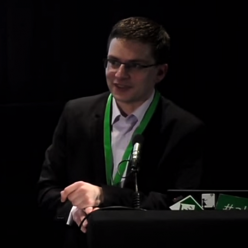 Netskills (2014). Teaching and Training Online – learning from the Netskills experience, JISC NetSkills, Newcastle University. Spiller, J. (2014). Online Evening Tutorials for Year 1 Medical Students Using Blackboard Collaborate, Institute for Academic Development, University of Edinburgh. Wang, S. and Hsu, H. (2008). Use of the Webinar Tool (Elluminate) to Support Training, Journal of Interactive Online Learning, 7(3), 175-194. Adapted from an original post on the ELDT blog: Blended learning designs using web conferencing for campus-based programmes. Conference attendance as part of my E-Learning Adviser role at the University of York.